So, the first official day of my graduate school career has come and gone and I survived. The way the school works for me is that I have 4 quarters a years. Fall, Winter, Spring, Summer. During the Fall and Spring, I spend 4 weeks working online, 2 weeks on campus and 4 more weeks online after that. Winter and Summer, all 10 weeks are online. So, this is my first quarter and I had 4 weeks to do stuff online and the next two weeks I am in St. Paul, Minnesota where the Seminary is located. Since I got all through the year, the way they have classes scheduled is in such a way that I am only scheduled for 2 major classes this quarter. Every day of this week, all day, I spend on one class. Next week, everyday, all day I spend on the second class. So it’s literally nearly a work week’s time worth of one class each week. This week: Hermeneutics. Learning how to properly interpret Scripture. Next Week: Transformational Leadership. Pretty self explanatory. Leadership that transforms. So day one was good. Lots of crazy stuff to think about. Met some cool people. I’m tired though. Very tired. 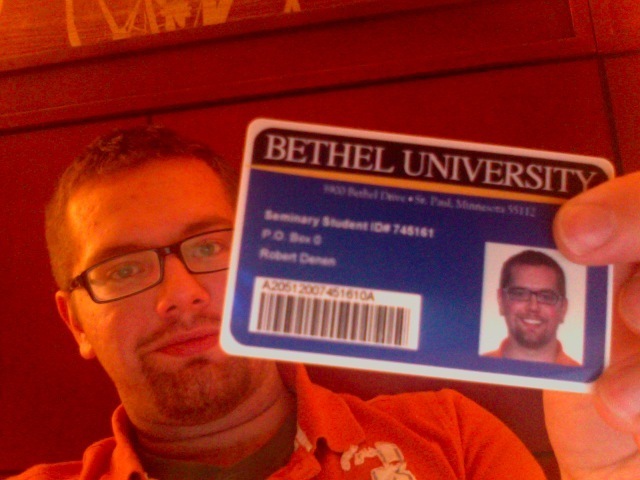 Just a little snippet….here is my lovely new Student ID. way to go Mr. (attending) graduate school. Have fun in St Paul….Studying..
now if i could only go to college….